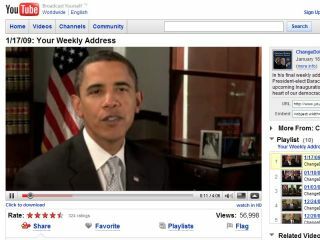 Does 'Click to download' Obama clip herald change? YouTube appears to have taken a step into video downloads – with the weekend seeing a few high-profile clips made available to the community. As Ars Technica reports, a video on Barack Obama's ChangeDotGov channel contains a small download link that could herald a major change in policy for the Google-owned video on demand giant. Previously, people have been able to host YouTube players on their blogs or websites by copying HTML code that points back to the mother site. However, users have not been able to (officially) download the clips to watch offline or save until this weekend, when visitors who went directly to a select few individual videos – rather than to a channel – could use a 'click to download' feature. YouTube can hardly be said to be hiding this feature away, given the amount of attention that Obama, and therefore his video channel, will receive as he is confirmed as the President of hope, goodness and human spirit. Oh, and the US as well. Should the practice become more widespread, it would indicate a sea change for YouTube. The company has previously resisted the practice, even despite its presence as a feature among its competitors. One note of caution, however, for those eagerly poised to download the full length movies that YouTube is beginning to offer: even with a widespread roll-out the chances are that submitters will be able to turn off the feature.